As Al-Qa‘ida and other terrorist groups continue to seek innovative ways to conduct attacks and circumvent security procedures, there is concern that the holiday season provides attractive opportunities for terrorists to target the Homeland. 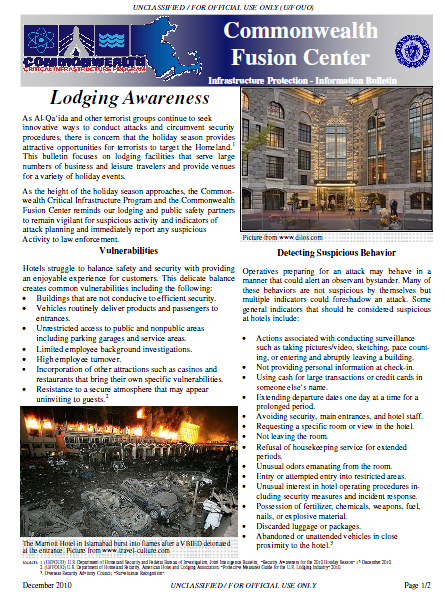 This bulletin focuses on lodging facilities that serve large numbers of business and leisure travelers and provide venues for a variety of holiday events. As the height of the holiday season approaches, the Commonwealth Critical Infrastructure Program and the Commonwealth Fusion Center reminds our lodging and public safety partners to remain vigilant for suspicious activity and indicators of attack planning and immediately report any suspicious Activity to law enforcement. • Buildings that are not conducive to efficient security. • Vehicles routinely deliver products and passengers to entrances. • Unrestricted access to public and nonpublic areas including parking garages and service areas. • Limited employee background investigations. • Incorporation of other attractions such as casinos and restaurants that bring their own specific vulnerabilities. • Actions associated with conducting surveillance such as taking pictures/video, sketching, pace counting, or entering and abruptly leaving a building. • Not providing personal information at check-in. • Using cash for large transactions or credit cards in someone else’s name. • Extending departure dates one day at a time for a prolonged period. • Avoiding security, main entrances, and hotel staff. • Requesting a specific room or view in the hotel. • Not leaving the room. • Refusal of housekeeping service for extended periods. • Unusual odors emanating from the room. • Entry or attempted entry into restricted areas. • Unusual interest in hotel operating procedures including security measures and incident response. • Possession of fertilizer, chemicals, weapons, fuel, nails, or explosive material. • Discarded luggage or packages.